I think I need the mini set...how bout you? It's not available yet but will be here: Sephora for OPI. i think i need a mini set too!!! i'm pretty much obsessed with all things glee. ha - I love this! I am such a sucker for nail polish...and Glee! I am with Vanessa! Gorgeous color! Who let the dorks out? Love it! Oh how fabulous! Really loving the Miss Bossy Pants- too much fun! Love that vampy first shade! OH YES...me too...I think I do. I think mini sets are a great idea for me because I rarely go through a whole bottle of nail polish. Great colors! I can't wait for Glee to start up again! I like some of the colors but not the glitter lol!! I would definitely rock the dark blue and the maroon color. I am a HUGE Gleek...and all of those colors are so fab! Love it. Thatll be such a cute collection! Minis are usually a good way to go since its hard to use a whole bottle of nail polish. Love all these colors! Gorgeous! I just bought 6 OPI the other day and the lady in the store was telling me about these cuties and I love them!! Katy Perry is coming out with a OPI color too. Not a fan of Glee but love Opi. 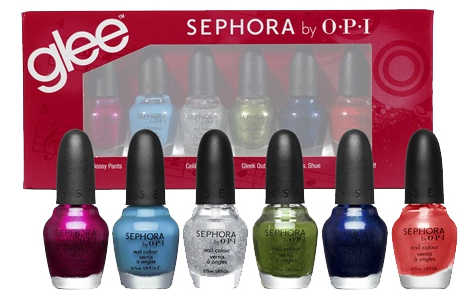 Glee nail polish set? Wow, that's cute! I love it and the names! The purple and light blue are my favorites from the set above. I want miss bossy pants!!! I wish someone would paint my nails every single night, i love painted nails but I hate the process of taking off and putting on and chipping, etc. That brilliant, the colours are great. But what has glee got to do with nail varnish, they will merchandise anything these days. Glee and nailpolish... two of my favorite things!! I love all the quirky names and the Express Yourself color is so pretty.